Cloud storage has been getting cheaper over time and while free tiers still get you just a few gigabytes, nowadays you can get as much as 100GB for a couple of bucks or 1TB for $10 per month. But one thing that’s always been a nuisance for me — at least with Dropbox and iCloud — is that you can’t share that with other family members and paying separate subscriptions for 1TB each is overkill. Today Apple is simplifying its iCloud storage plans to address that: The 1TB storage option has been replaced for the 2TB tier at the same $9.99 per month price point. 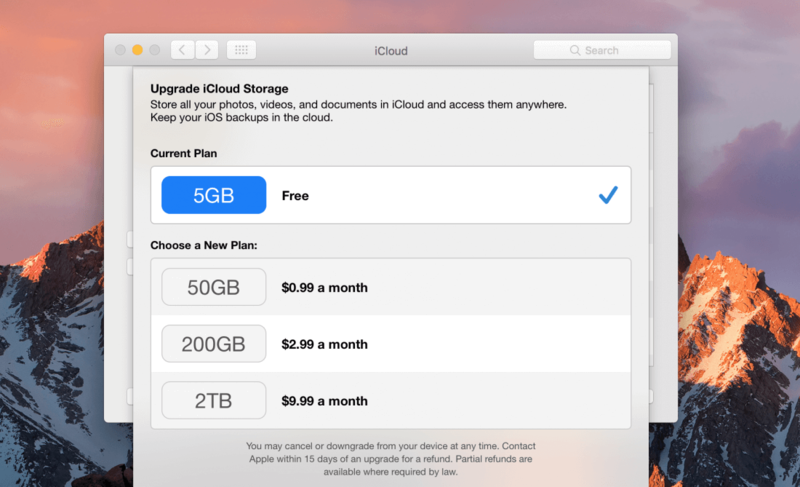 Pricing for Apple's 50GB and 200GB iCloud storage plans remains unchanged, at $0.99 and $2.99 respectively. This puts Apple's value ahead of competitors like Google Drive and Dropbox at that storage level, although if you need more than that you are still better off with Google Drive and Amazon’s Cloud Drive. In addition to the bump in storage, those on the top two paid storage plans — 200GB and 2TB — now get to share it with up to six family members. This further brings costs down for families who were paying for each member’s iCloud plan individually and had plenty free storage left unused. Apple's 2TB plan at the new price level is available now and anyone previously subscribed to the 1TB plan has been automatically upgraded. Family Sharing will only be possible with iOS 11 and macOS High Sierra, both of which will ship to the general public this fall.